Mpumalanga lies in eastern South Africa, north of KwaZulu-Natal and bordering Swaziland and Mozambique. The name means east or literally "the place where the sun rises" in Swazi, Xhosa, Ndebele and Zulu. It constitutes 6.5% of South Africa's land area. 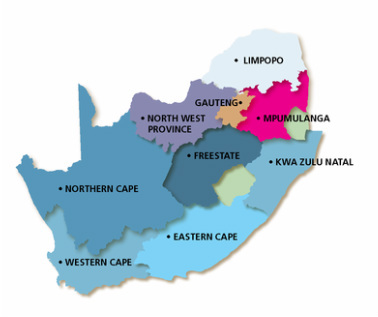 In the north it borders on Limpopo, to the west Gauteng, to the southwest the Free State and to the south KwaZulu-Natal. The capital is Nelspruit (recently renamed to Mbombela). Before 1994, Mpumalanga was part of Transvaal Province. The Drakensberg Escarpment divides Mpumalanga into a westerly half consisting mainly of high-altitude grassland called "the Highveld" and an eastern half situated in low altitude subtropical Lowveld/Bushveld, mostly savanna habitat. The southern half of the Kruger National Park is in the latter region.